While taking a walk in the snow, the pet goose Petunia meets Charles, a most charming and handsome gander. Handsome, yes-and hefty, because poor Charles is being fattened for Christmas dinner by the farmer next door. Will the gander of Petunia's dreams be served up roasted, with applesauce on the side? 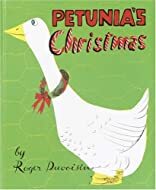 Petunia's determination to save Charles, even if it means posing as Santa Claus, results in "one of the simplest, funniest, and most original of Christmas stories," wrote the Chicago Tribune when this book was originally published in 1952. A yuletide classic by a Caldecott Medal winner, Petunia's Christmas is still making children laugh as it shows the true spirit of Christmas.